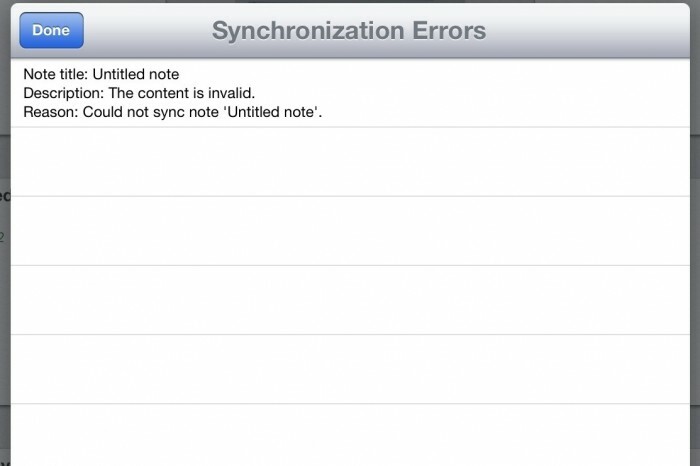 Solved: Evernote for iPad “Could not sync note” Synchronization Error - ishotjr.com - Put a little mustard on it! I made the switch from OneNote to Evernote several years ago due to the latter’s superior app availability for the plethora of devices that I use. Despite comparatively feeble editing capabilities, Evernote’s device agnosticism gave it the edge for me. In the past few months, however, it had become barely usable on my iPad due to a “Could not sync note: The content is invalid” error that would pop up continually while I was trying to work. After finding no solutions initially, I pretty much gave up and resorted to brief read-only sessions only when using the iPad. But I decided to give it another shot today and while perusing a very long thread documenting others’ experience with the issue, found one post that mentioned finding the offending notes in the Trash. Frankly, I’d never even noticed the Trash on the iPad app, but managed to locate it eventually under Notebooks, and then sorted by Title to find and eliminate all notes titled “Untitled note” – there were a fair number, but I eventually made it down to one from several months ago which still had the little blue “pending sync” arrow next to it, and deleting that note immediately silenced the pop-ups. I vaguely recall that when this started I had accidentally created multiple notes with a few errant taps, and must have deleted the duplicates faster than it could sync or perhaps during, which seemed to be the cause of this issue. I’m very pleased to have Evernote back to normal on my iPad, not popping up an error message continually and making the app unusable! 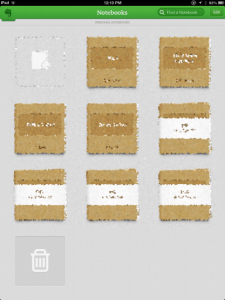 How do i find the “trash” to remove Evernote sync file causing the problem. I have looked all over but can’t seem to locate it? Let me know if you’re still having trouble! Thank you!!! This has been bugging me for 6 months! Your solution took 1 minute and no more error pop up! Thank you so much…this was very aggravating and I could not figure out what was causing. You led me directly to it and it fixed it. Thank you, thank you, thank you!! This has been plaguing me for days! I just kept thinking it would magically fix itself somehow. I did empty the trash on my iPhone but the menacing error wouldn’t go away until I found the actual note in my notes that had the blue arrow. After I deleted those, I was golden! For me what else happened was on my iPhone I still created another note even though the syncing wasn’t fixed. Duh! You have to fix the sync issue first before adding any more notes. Thank you! What a gloriously easy fix! I have deleted the items in my trash notebook (the offending note was indeed in there) but the note is still in my ipad (but not on my PC) and I can’t delete it. Syncing doesn’t help. Any ideas? To clarify, on what device did you delete the note? 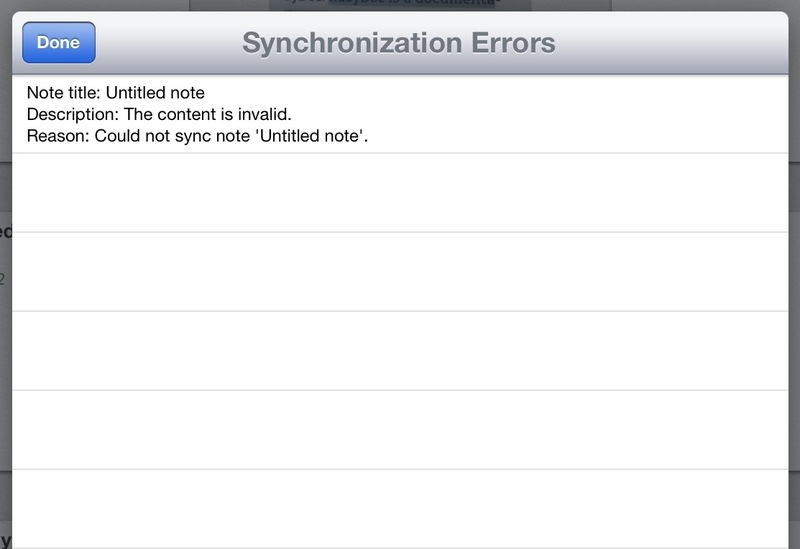 It should only be on the iPad – since by definition it has not been sync’ed? Have you tried removing and reinstalling the app? Worked for me too. Many thanks. Deleted trash folder on iphone and the files in the other folders then all synced fine – including those that had a blue arrow against them. Man, it works! Been plagued for months, now the pain is gone.. Awesome! Thanks for posting – that error popup was driving me crazy!! Thank you for posting. I can’t tell you how many times I tried to fix this problem only to get frustrated. Evernote is again my best friend. Thank you so much!!! Thanks to you this problem, that has been driving me crazy for months, is finally fixed!!! You are Awesome!!! Thank you very much, solved the problem!